A space busy parents can use to help balance their work & childcare commitments in addition our aim is to help families do less of the traffic and travel and get quality time back in their day. Studio 64 is leading the concept here in Western Australia. Located in South Perth this center has everything, I know you will be as impressed as I am. Discover more today in my chat with the Founder Kelly Chapman. Hi Kelly, Thank you for putting some time aside today to chat with Us! I would love to know where this concept came from? Sometimes when juggling children and work, particularly flexible and part time work (which doesn’t stop when you “clock off”), it can be difficult to work from home with toddlers at your heels. I found myself booking in to my local gym putting the kids in creche for an hour, just so I could go and sit in the gym café to make some business calls and do an hours’ work on the laptop. The first day I did this I looked around and noticed at least three other mothers who were doing exactly the same thing, on laptops and work calls, and I started to think there had to be a better way of doing this….. hence the Studio 64 idea was born. I'd love to know more about You? I have three boys, a four-year-old and two-year-old twins which keeps me crazily busy. My background is in law and executive management having commenced my career at a large commercial Law firm, Gadens Lawyers, in Melbourne. My husband and I moved to Perth in 2010 where I joined the executive management team of Hawaiian, a Perth private equity and property group. In addition to being current Chair and Founder of Studio 64 Group, I am also the Managing Director of a property group, Rpoint Properties, and am a Non-Executive Director of the Bangarra Group in Melbourne and LD TOTAL, WA’s largest landscaping firm. We know South Perth for its amazing river views, why choose South Perth as the location for Studio 64? South Perth has so much to offer. It’s so well located in terms of the City and the freeway. It’s close to the action but not so close that its inconvenient. We’re located on a beautiful leafy street one street back from the stunning South Perth foreshore and a short stroll to the zoo which allows us to take the children on some amazing excursions. For those commuting into the CBD we’re a quick drop off the freeway and we even have parking located on site so parents can park hassle free and catch the ferry/bus into the city or elsewhere. For those using the workspace, South Perth is a great central business location, with easy access into the CBD or other areas for those who may be meeting with clients. Studio 64 growth vision is around building convenient inner suburban Studio 64 Hubs that are a ‘one stop shop’ for parents, being really accessible and well located around the City, so we are looking for more South Perth-like opportunities in that regard. What is your point of differences compared to other centres and childcare facilities in Western Australia? Our key point of difference is that we don’t just offer workspace and childcare, we take a holistic view of helping busy parents & professionals by offering a range of other services. These includes things like next day grocery delivery, same day ironing, on-site parking, mobile hair and beauty services, car detailing and more. The whole Parent Convenience Package. We are also quite different to the hot-desking in daycare scenario as we provide client interfacing business options. Many professionals (who also happen to be parents) wouldn’t feel comfortable asking their clients or connections to come and meet them at a spare desk in colourfully decorated daycare centre named “Giggles” or “Bambinos”. For this reason, Studio 64 has designed a corporate looking reception, board room, 9 furnished offices etc so our professionals can feel very comfortable inviting clients to Studio 64 for a meeting. Studio 64 workspace and childcare is also owned and operated as one by the same company. So, unlike other services that attach workspace to existing separate child care centres, we can control and ensure a quality offering across both where the same values, standards and relationships are maintained. As we’re an approved early learning centre and not a crèche, those working on site are able to leave the premises whenever they desire and they’re also still entitled to the CCR and CCB, which makes it a more affordable and practical solution. We also offer casual days and 3hr sessions for those that don’t want to be locked into permanent bookings. Who currently will we find in the co-working space at Studio 64? Any parent knows how difficult it is to get a few seconds to themselves or to spend quality time with their families. Studio 64’s aim is to help families do less of the traffic and travel and get quality time back in their day (64 more moments back in their day would be handy!) We wanted a name that was memorable and interesting and I was passionate about ensuring that it had no similarity to the current type of Early Learning Centre names. We wanted to find a word that reflected the multiple functionalities of the space and the idea of everything being in the one location which is where the word Studio come from. 64 is the street number for our first Studio Hub. Studio 64 it is. What do you find is the biggest challenge when owning you own business? The grunt, tenacity and resilience required – it can be, quite frankly, tiring but also seriously rewarding. What activities / program do you do with the children? We follow the Early Years Learning Framework and draw on philosophies such as Reggio Emilio to create play based learning programs for the children. 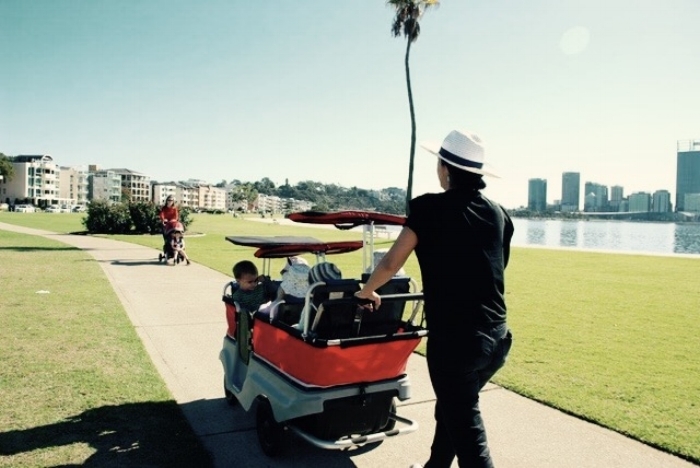 We encourage outdoor exploration and have a giant pram we use, called the turtle, which can take children on regular walks along the South Perth Foreshore and to the zoo. We also work with the community and the South Perth library comes in to read to the children, we have visits from Amana Living to encourage intergenerational relationships and run Pyjama Drama classes to inspire imagination and play. Over past months we’ve had a visit from the Kensington Fire brigade, a female Qantas pilot and a professional race car driver. called the turtle, which can take children on regular walks along the South Perth Foreshore and to the zoo." How many days do you recommend the children attend? Our Centre Director and our Educational Leader are charged with assisting families with advice on this as it can depend on the child, the family and a range of factors. There is no one size fits all approach with children. It’s important for children and families to have time to build relationships with our Educators. My advice is to do what works for you and your child, in consultation with the educators, and ultimately what makes you feel comfortable. Can Dad’s join or is it only a female co-working space? Absolutely. Studio 64 is for the whole family. We have been quite specific about ensuring we don’t just target ourselves to females. We currently have dad’s that use the space, some who run their own businesses and others who work for large national companies that don’t have physical offices here in Western Australia. Who do you look up to for inspiration when designing the spaces? We were working with a large existing building for the South Perth hub, which used to be well loved by Legacy WA so we wanted to work with the history of the building and all the heights and character that goes along with that (mildly retro in this case). I’ve been a true “Renovation Queen Wannabe” for a decade now so we are constantly drawing inspiration from a variety of sources to culminate in a rather ‘eclectic’ mix. For the Early Learning Centre, my Pinterest is full of inspiration from Scandinavian countries, Singaporean centres and boutique Sydney centres. 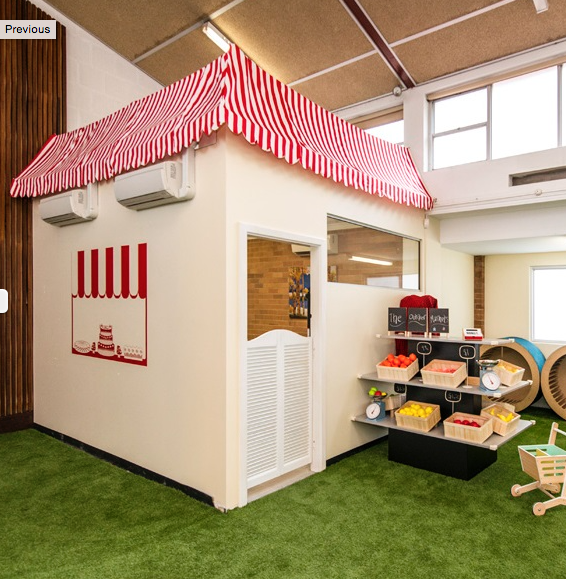 We’ve tried to create a unique look through innovative themes and ideas, and clutter free spaces, to promote a relaxing, fun and flexible environment for the little ones. I love the beauty / hair room can you please let me know how that works? What is your advice to WA Women wanting to start their own business? In my opinion, this is an opportune time for women in business, particularly in WA. We are seeing first hand at Studio 64 female business owners and entrepreneurs ‘having a go’ and more than succeeding. It’s just so great to see. WA, whilst being ahead in some sectors is relatively young and underdeveloped in many others, and although this can be seen as a disadvantage and an imposition on current business growth, I see it as a great opportunity to draw inspiration from more mature cities and cultures (whether over East or overseas) and have a great impact with the implementation of those ideas and concepts in this city, or vice versa – launch an idea here in this smaller softer market, and perfect it, with a view to scaling it to a national/international business if appropriate. Female centric markets (and female controlled discretionary spending) is on a very strong growth projection. This shouldn’t be underestimated. So, my advice is to ‘use that female brain to its fullest potential’, we have a truly special knack for balancing things, a deep intuition and understanding of life’s ‘nuances’ which can be a strong advantage in business. · Be bold, back yourself, but always, always triple check the numbers! Make sure it stacks up financially. There are a lot of great innovative ideas out there but not all of them can be set up to operate to a sustainable return. · Pick a growth sector and try to pick a gap. · Don’t be afraid to travel and soak up different things, be open minded, in my opinion travel can inspire idea generation and a bigger picture perspective. · Be smart and selective about who you listen to and learn from. · Truly value your time, in terms of factoring in its financial worth in your business and also in terms of simply being efficient and productive with time. Studio 64 is currently working on opening additional hubs. But I also have a Vision for 2018 which involves me with a cocktail in hand at some stage --- i.e. not in my painting gear creating tree murals at midnight on a Saturday night, so we might have to stick with the addition of 1 or 2 more Studio 64 Hubs for the time being. Offer valid for use from 1 December to 22 December inclusive. Includes 1 free week of childcare and office use. Must be used in the same week. Offer is subject to availability in both the workspace and early learning centre. Your favorite WA restaurant, Dr Clause, Claisebrook, it’s not a restaurant per se but it’s my funky everyday local coffee, wine, lunch haunt - just love it, in the coolest little corner of town.